Adventure is the spice of life. And our Piri-Piri sauce is a spicy adventure for sure. 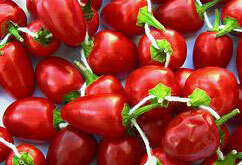 The tiny Piri-Piri chili pepper (Swahili for pepper-pepper) grows wild in Southern Africa. Almost since the beginning of time, locals have harvested it and mixed it with herbs and natural oils to make delicious sauces, marinades and bastes for grilled fish and chicken. Boatloads of hungry Portuguese explorers dropped in sometime in the 1590s and immediately fell in love with this new flavor. So much so that they didn’t bother going home. And Piri-Piri’s rumored aphrodisiac qualities helped ensure the new colonies thrived. Now the unique and unforgettable flavor of Piri-Piri lives on with Humdingers Piri-Piri sauce–as does the adventure.